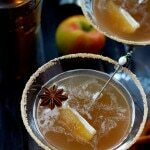 An apple cider martini made with chilled homemade cinnamony apple cider shaken with apple vodka, caramel vodka, and apple sour puss. A fall flavored cocktail. Wash apples and the oranges, and then roughly cut into quarters. (Don't worry about removing peels, seeds, or stems.) Place in a big pot over medium heat. Add the cinnamon sticks, nutmeg, cloves, allspice, star annise, and halved vanilla bean. Add the water and bring to a boil then turn down the heat. Simmer on med-low for 3 hours. About an hour before the cider is done cooking, use a potato masher (or tongs or the side of a spoon) to mash the apple and orange slices once they are soft. Finish cooking for one more hour. When its done, strain through a cheese cloth and squeeze the apples in the cheese cloth to get maximum flavor from the apples. Dip the edge of your glasses into a little water or lime juice. Then dip the rims in the sugar and cinnamon mixture. Tap off any excess. Put 6 or so ice cubes into a martini shaker. Add all the ingredients for the cocktail, shake well and pour into martini glasses. Add a slice of apple and/or a star annise for garnish if you like. You can also make the apple cider in a crock pot if you like.